Mon., Aug. 28, 2017, 6:56 p.m.
Senior CB Victor Gamboa has been suspended indefinitely from the team for an undisclosed “violation of team rules,” coach Aaron Best said on Monday. Gamboa, a fixture in the secondary for three years with 22 career starts, is practicing with the team but will not make the trip for the season opener at Texas Tech. “We’ve talked about where he needs to go from here,” said Best, who said the suspension is indefinite. For three Eastern Washington football players, the opening-week depth chart is much more than a sheet of paper. It’s sweet redemption, the tangible reward for overcoming injury, idleness and self-doubt, sometimes all three at the same time. The payoff came Monday afternoon after a hot practice at Roos Field. “It feels great,” said wide receiver Terence Grady, who took one for the team last year, redshirting in the middle of his career. “We have a lot of competition at wideout, a lot of young guys, smart guys, smarter than my recruiting class,” said Grady, who still managed to earn a starting spot in Saturday’s opener at Texas Tech. “Now we’re going to take care of business,” Grady said. That goes double for two local players. 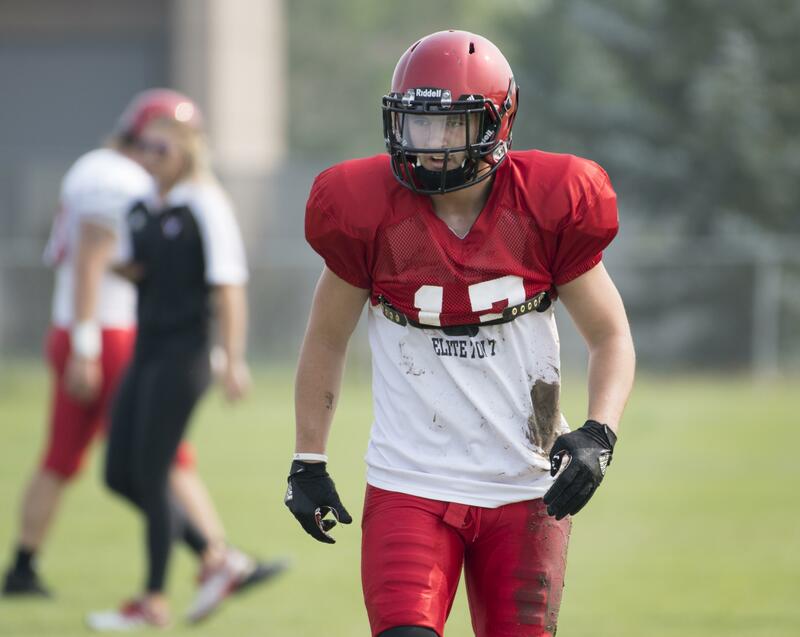 Ferris product Cole Karstetter overcame a devastating Achilles injury to reclaim his starting spot at roverback, while former North Central star Jake Hoffman will begin his senior year atop the depth chart at safety. “They’ve definitely earned it,” coach Aaron Best said after Monday’s practice. Best added that in Eastern’s case, the depth chart is more than a list. At most positions, “We’ve got enough to rob more than Peter and pay more than Paul,” Best said. “Depth isn’t just having three guys listed, it’s having three guys you can rely on,” Best said. Quarterback: Gage Gubrud is the starter, backed up by redshirt freshman Eric Barriere and true freshman Nick Moore. Running back: True sophomore Antoine Custer, the leader throughout camp, won the starting role with his speed. Sam McPherson and Tamarick Pierce are the top backups. Wide receiver: Grady, senior Nick Sblendorio and junior Nsimba Webster are the starters, but 10 players are listed in a deep group. True freshman Johnny Edwards IV has made the two-deep after a strong fall camp. Tight end: In a mild surprise, junior Henderson Belk is No. 1, ahead of Jayce Gilder and Talolo Limu-Jones. Offensive line: The Eagles had to move some pieces after the mid-camp departure of starting left tackle Nick Ellison. His replacement is former starting RT Chris Schlichting, who in turn is replaced by former backup Kaleb Levao. The inside is unchanged: Tristen Taylor will start at left guard, Spencer Blackburn at center and Matt Meyer at right guard. Defensive line: The starting lineup has seemingly been set since spring. Jay-Tee Tiuli is the anchor at nose tackle, Andre Lino starts at tackle, senior Albert Havili at buck end – the primary pass-rushing spot – and Cheney product Keenan Williams at field end. Linebacker: Junior Ketner Kupp is the starter on the strong side, with sophomore Jack Sendelbach the top backup. Kurt Calhoun and Andrew Katzenberger will man the middle. Roverback: Karstetter will be backed up by senior John Kreifels. Cornerback: Josh Lewis and Nzuzi Webster top the chart, with D’londo Tucker and Brandon Montgomery the top backups following the suspension of Victor Gamboa. Webster also could slide to nickel back, depending on the situation. Safety: Hoffman and sophomore Tysen Prunty are 1-2 at one spot, with Mitch Fettig and true freshman Anfernee Gurley on the other side. Special Teams: Roldan Alcobendas will kick field goals and extra points, while Jordan Dascalo will handle punts and kickoffs. Nsimba Webster and Custer are the top candidates at kickoff return and Zach Eagle and McPherson the top punt returners. Published: Aug. 28, 2017, 6:56 p.m.